ANNIHILATION continues here! Beaten and nearly dead, Nova prepares to go back into battle! 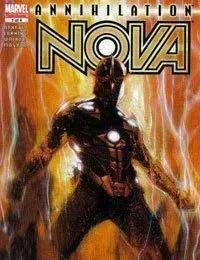 Can Nova cope with the awful burden of Xandar's legacy? Can he carry a warning to friendly space? Can he even stay alive for another five minutes with the murdering hosts of the Annihilation Wave closing in?